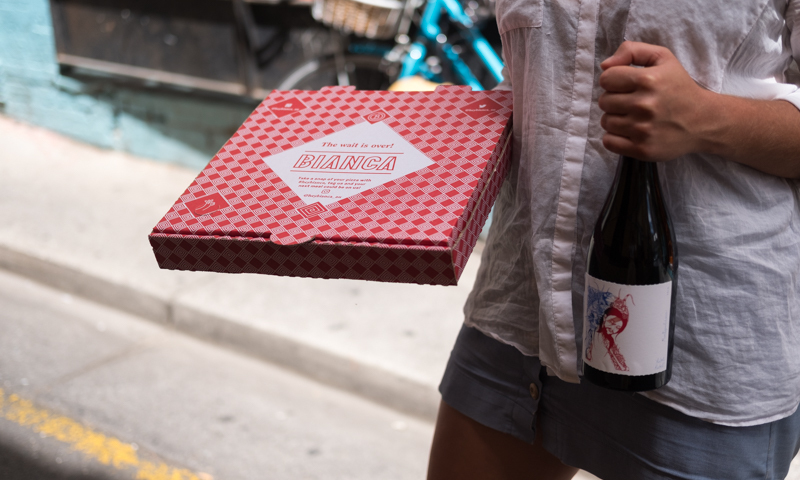 Bottles of Alpha Box & Dice delivered to your door when you need it, via Bianca pizza. Pizza and wine. Wine and pizza. Is there a better combination? Probably not. It makes sense then that Bianca has teamed up with Alpha Box & Dice to deliver both pizza and wine straight to your door. Alpha Box & Dice have been in the delivery business for a time now, shipping directly to customers daily straight from their cellar door, however, partnering with Bianca means that the wine can now be delivered on demand within minutes from ordering. Alpha Box & Dice are in the Life Improvement business, and their partnership with Bianca makes things even better. The new partnership was an obvious one for Bianca owner, Aman Takhar, who says he was searching for the right local brand to partner with. “South Australia has some of the best wines in the world, so it made so much sense. Alpha Box & Dice has such good wine it was a natural fit,” Aman. Beyond the obvious (local pizza + local wine = a good time), the partnership sees a knowledge sharing opportunity for two burgeoning South Australian business. The partnership offers Bianca customers a relatively large wine list, including the elusive Hercules Shiraz. “Aman was keen to launch with a wide range of AB&D products, just to see what people are drawn to and if any patterns emerge. Essentially, it ticks most boxes for what you would expect from a wine list – sparkling, red, white, rosé, etc – so there should be something to cover all bases from a wine perspective,” Lachlan says. But, most importantly, the pizza and wines match beautifully.